Shaping, guiding and controlling brand story used to be much simpler. In the “read-only” society (a term I learned from Geoff Colon) brands communicated and people could only listen. But today, everyone is a publisher. Customers can be a participant. They can share their opinions whether based on truth or something else. All of this can quickly transmogrify into volatile resentment that can send stock prices plummeting and wipe millions of dollars off the value of a brand in the span of 24 hours. We’ve explored the idea of the “Collective Journey” approach to storytelling here on Branding Strategy Insider to illustrate how, in the modern world, story has become porous. A brand’s assessment of its purpose and communication strategy continues to be the source narrative, but now it becomes intertwined with the personal, narrative rivers of customers and critics. This reality is dangerous given society’s ugly trend of outrage archaeology, where anything a brand or personality has done in the past can come back to ruin businesses and careers. This is why a recent announcement from Patagonia should catch your attention. 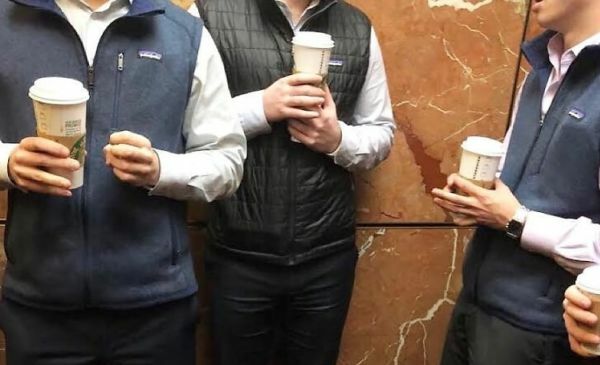 In the past few years, the Patagonia vest has become a status symbol among FinServ and Tech firms who have engaged the brand through their corporate sales program. Patagonia’s high-quality products, emblazoned with the logo of [insert your top firm] have become a uniform-of-sorts among the elite within the world’s most prestigious firms. An Instagram account (It seems to be a parody, but in today’s world, who knows?) called @midtownuniform chronicles global sightings of FinServ bros wearing their logo vests out and about. You see, last year, Patagonia updated their mission statement to read, “We’re in business to save our home planet.” And the brand has taken substantial actions to back that up, from lawsuits against the US government in opposition to land-use rights, to pledging to use all gains from tax cuts enacted by recent legislation to protect natural resources. This move seems consistent with the updated mission. This additional step, to curtail the selling of co-branded gear with companies they consider “ecologically damaging,” such as the oil and mining industries, religious groups, political-affiliated organizations and financial institutions, further advances behaviors that are consistent with their mission. While this principled stand isn’t without loopholes, as noted by Gwynedd Stuart in Los Angeles Magazine, it does send a signal. Patagonia is the gold-standard for purpose-driven brands. As true purpose (not the marketing veneer of purpose) grows in importance among consumers, what Patagonia is doing is important for all brands to watch. The acknowledgement on their part, that co-branding with ethically questionable/purpose incompatible businesses might have consequences for their brand should highlight how critical it is for all brands to evaluate partnerships, regardless of what agreements happen between businesses or high-profile customers. Who you are and where you associate right now can be the difference between winning and managing the decline.